IT was back in 1989 when Australians were first presented with Hyundai's mid-size sedan Sonata. 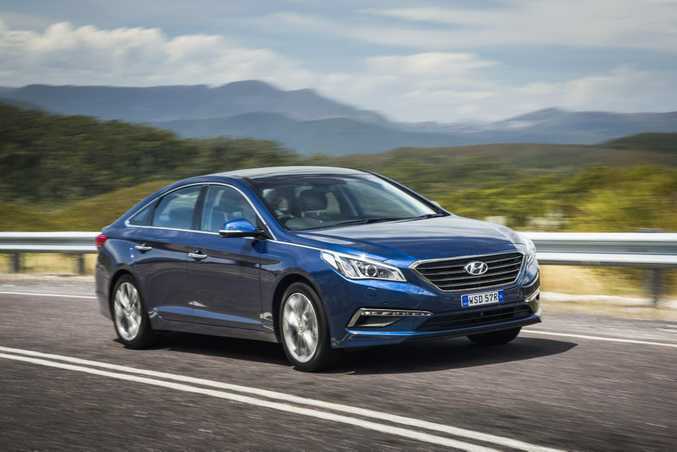 It's a name that hardly send shivers of excitement down the spine, but after a five-year hiatus, Sonata is back with its seventh generation model and offering reasons to get more enthusiastic over the model this time round. 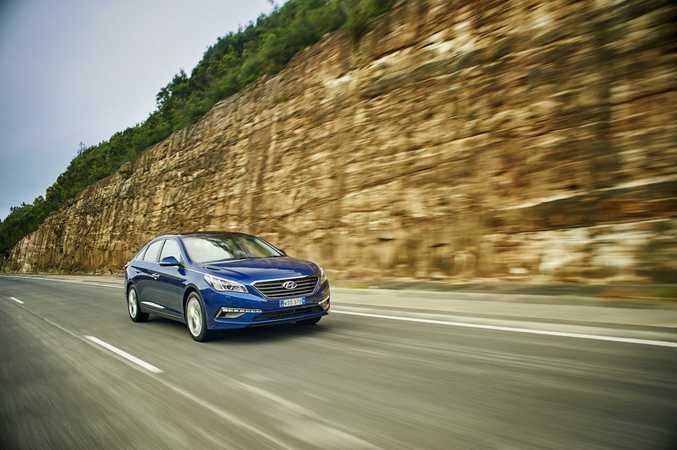 For starters it's available with an eager 180kW turbo engine which hurries the big sedan on at a pleasing rate, and after testing it over notoriously tough stretches of Targa Tasmania roads, the vast work put in to Australianising the Sonata's suspension has paid dividends. It's a decent steer yet still retains admirable composure and comfort demanded of a car in this segment. And it's a tough segment. Buyers have been fleeing the mid-size sedan class in droves - mainly for the funkier SUV segment - and those who remain, typically fleet and government-type sales, are overwhelmingly in Toyota Camry's corner. Adding a drop of confusion, Hyundai already has its i40 mid-size sedan offering in this segment. Buyers of the i40 can opt for both wagons and diesels, neither of which are available on the new Sonata; it effectively being a replacement for the hastily dropped i45. Puzzled? In short the 'i' Hyundais are aimed at Europeans where wagons and diesels are popular, and the 'named' Hyundais - like Sonata - are typically for the rest of the world. 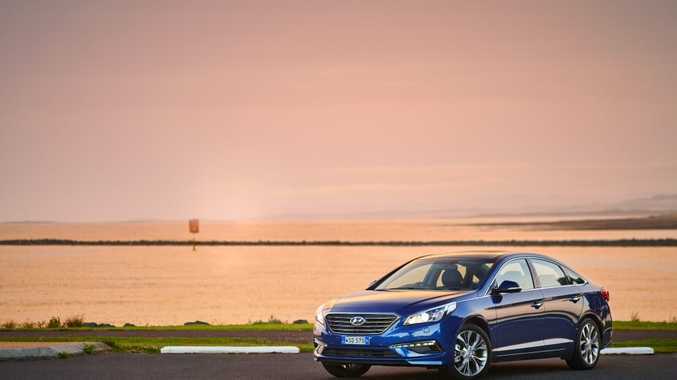 By offering Australian customers both the i45 and Sonata, Hyundai is effectively covering all bases, albeit a touch confusingly. The Sonata is available in three guises: Active, Elite and Premium. Active receives a 138kW naturally aspirated 2.4-litre four-cylinder, while Elite and Premium get the 180kW 2.0-litre turbo four-cylinder; all are petrols and all come with a six-speed auto with sequential change. Decent value is seen with the Active costing $29,990, the Elite $36,990 and Premium is $41,990, all before on-roads. If space is a must, the new Sonata excels. The cabin is vast, head and leg room for back seat passengers superb, and boot space cavernous. Little wonder the American market classifies Sonata as a large rather than mid-size car. Front seats are comfortable if not luxurious, and are preferable in leather-appointed specification once you move out of Active's cloth chairs. Elite and Premium cars receive 12-way adjustable electric driver's seats, while Premium front passengers also get the power upgrade. The dash and doors have plenty of soft touch finishes; storage and cubby holes are abundant, but it's a shame the cabin doesn't feel much more premium than the entry-level Active when moving to the top shelf models. The Sonata's steering wheel also lacks any chunkiness or pleasing feel, something that would be appreciated on such a large car. Hyundais, ease of use in the cabin is a real plus point and it takes minutes rather than weeks to master the controls. Credit where it's due, Hyundai has committed to exhaustive and expensive Australia-specific suspension tuning on recent models, and Sonata is no exception. The car has been tuned by Aussies for Aussie roads and drivers, with 30 different suspension combinations evaluated and numerous dampers, springs and sway bars tested and fettled to find what Hyundai Australia deemed the optimal mix of comfort and handling. There's been a fair bit of love gone in here, and it shows. The entry-level Active errs more on the side of comfort, but is still a competent handler and was unruffled along twisting roads and uneven surfaces, remaining big-car graceful at all times. The steering was a little too light to attack corners accurately, and although the 2.4-litre non-turbo motor was quiet and refined, getting into the turbo 2.0-litre variants proved that this engine is the preferred option. With 180kW and 350Nm, the Elite and Premium Sonatas give impressive urge through the rev range, without ever feeling truly fast. These pricier variants also receive a stiffer rear sway bar, stiffer front springs and different dampers than the Active, and the improvements make for a more enjoyable back road fling. In Sport mode the gears are held longer and the steering seems to offer more weight and feedback, and especially with the Premium's 18-inch wheels and lower-profile Kumho tyres (other Sonatas run on chunkier 17-inch rubber), it's quite good fun to throw around a bit, with minimal body roll, nice balance and a fair bit of grip. 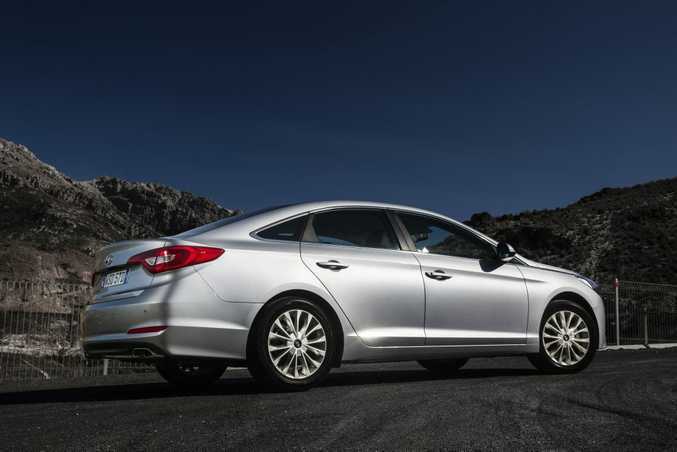 Impressively, the Premium Sonata's wheel and tyre setup don't seem to compromise its smoothness. The six-speed autos do their jobs well, although a couple of extra cogs wouldn't go amiss, and steering wheel paddles for the Premium especially would have been appreciated. With the Sonata Actives prime fleet car fodder, they're not flush with gear as standard, but for a $30k mid-size car that's expected. Highlights are a rear view camera and rear park assist, keyless entry, steering wheel controls, cruise control, small touchscreen and 17-inch alloys. Move into the Elite and not only do you get the better engine, but also an electric driver's seat, 20.3cm touch-screen with sat nav, hands-free boot opening, leather appointed seats and dual zone climate control. The Elite costs seven grand more than the Active, but there's enough here - especially the engine - to make it the pick of the range. Four more grand gets you in the Premium with its additional 18-inch wheels, front park assist, trick headlamps, electronic park brake, heated and ventilated seats, rain sensing wipers and a Panoramic glass sunroof. 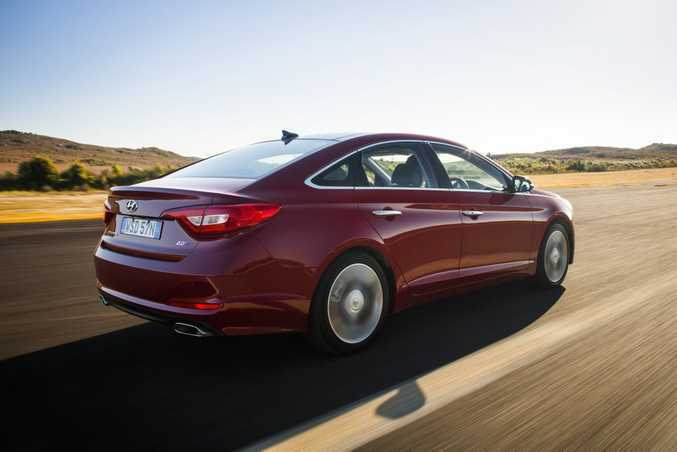 Space will rarely be an issue as the new Sonata has a mighty cabin to seat four and even five adults in roomy comfort. It has just about the same boot space as the Camry's (which is whopping), making the Sonata a decent 14-litres larger than a Holden Commodore. Towing capacity is 1300kg. It's not all good news on the engine front. Quoted fuel economy figures are 8.3 litres/100km for the 2.4-litre and 9.2 litres for the turbo 2.0-litre. Not bad when compared with previous mid-size sedans, but with smart economical turbo engines now the norm, the Elite and Premium's figure isn't something to shout about. Our test drives, incidentally, returned closer to 11-litres/100km, but this was mainly over Targa Tasmania routes. An antidote arrives with Hyundai's excellent warranty and lifetime capped price servicing. Hyundai's own i40, Mazda 6, Subaru Liberty, VW Passat and the best-selling king of the segment, Toyota Camry, are all fighting for sales in this shrinking segment. The new Sonata has decent road presence, showcasing Hyundai's Fluidic Sculpture 2.0 design principles as seen in its flagship Genesis model. It has nowhere near the wow factor of the Genesis however, and could have been a little less conservative in its styling to stand out in the mid-size sedan crowd. Owning a Sonata was never something to brag about to your mates, but the 2015 offering is no embarrassment. Its sheer size surprises and pleases, and the extensive Australia-specific suspension work has reaped rewards, striking an impressive balance between comfort and handling. The 2.0-litre petrol four-cylinder offers nice power and flexibility, albeit in a slightly thirsty manner, and while the interiors may seem a little bland, they are comfy, practically void of tacky plastics and easy to navigate. Fleet car drivers will likely end up with the Active - and is no bad thing for $30k - but shoppers should go the Elite for the best value Sonata: it shouldn't disappoint. What we liked: The obvious love that's gone into Australianising the suspension, the simple and functional cabin layout and infotainment system, refined and eager engines, especially the turbo. What we'd like to see: Improved fuel economy from the turbo, a braver exterior design to stand out in this segment, some special trim on the Premium model to differentiate it. Servicing and warranty: Five-year unlimited kilometre warranty and lifetime capped price servicing. Servicing intervals for the turbo are six months or 10,000km, with prices alternating between $159 and $259. The 2.4-litre intervals are annual or 15,000km, priced at $259. Model: 2015 Hyundai Sonata (seventh generation). Details: Four-door front-wheel drive mid-size sedan. Engines: 2.4-litre four-cylinder (Active model) generating maximum power of 138kW @ 6000rpm and peak torque of 241Nm @ 4000rpm; 2.0-litre turbocharged four-cylinder (Elite and Premium models) has 180kW @ 6000rpm and 350Nm @ 1400-4000rpm. Transmission: Six-speed automatic across the range. Performance: 0-100km/h in 8.3 secs (Active) and 7.2 secs (Elite and Premium). Consumption: Active uses 8.3 litres/100km (combined average), Elite and Premium return 9.2 litres/100km (combined average). CO2: 194g/km (Active), 213g/km (Elite and Premium). Bottom line plus on-roads: Active $29,990, Elite $36,990, Premium $41,990.